Through our various media platforms, our mission is to help support and nurture women to become the best versions of themselves. 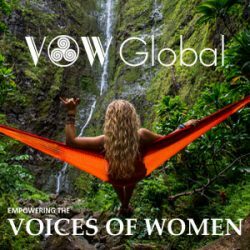 By empowering their voices, their minds and spirits, we hope to globally inspire women to be conscious, strong individuals, mindful in business, relationships, health and the planet they live in. Jody is the CEO of the Femina Media Group, parent company of Women in Podcasting. She holds the same roles with a matrix of businesses including FMG Radio, TV, and Dynamic Women. Each individual company synergistically delivers practical and inspiring information to empower women. Jody started the Women in Podcasting directory in 2005, and soon after became one of the first American women to teach blogging and podcasting in China. Working closely with celebrities such as Chaka Khan; with charity organizations; The Sole of Africa with Nelson Mandela, and with clients featured on 20/20, Good Morning America, Oprah, and Dr. Phil, Jody has been a pioneer – and an insider’s mentor – in the realms of internet marketing, new media, social networking, and business strategy development. Her deep love of humanity inspires her to support a variety of causes through the soon to be launched, Dynamic Women Speakers Academy; which trains and empowers Women to be financially sustainable and give back to causes that touch their hearts.